Digital signage systems include display screens, media players, content management systems, player software, mounting accessories, cables and power supply to display dynamic or static visual content in indoor or outdoor environment for the purpose of information display, advertising or promotion of products and services. According to 6Wresearch, GCC digital signage market size is forecast grow at a CAGR of 12% during 2017-2023. The development of commercial infrastructure owing to increasing dependence of government in the region on non-hydrocarbon economic sectors such as Tourism, Hospitality, Education and Retail has led to rapid growth of GCC digital signage market forecast period revenues. The propensity to spend of the Gulf countries on digital advertisement and continuous innovation in technology have also contributed to the growth of the market. Amongst all verticals, retail, hospitality & government & transportation verticals have captured majority GCC digital signage market share in 2016. UAE, Saudi Arabia, and Qatar have led the market in terms of both revenues and volume. Key players in the market include LG, Samsung, Sharp, Panasonic, Mood Media, NEC, Sony, Toshiba, BenQ, Scala, and Navori. 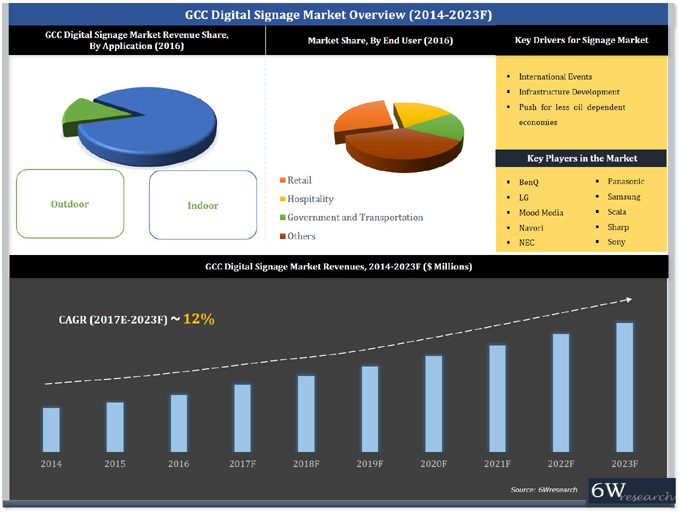 The GCC digital signage market report thoroughly covers GCC digital signage market by components, display screen types, display screen technologies, display screen size, content media players, software, verticals, applications, regions, and competitive landscape. The GCC digital signage market outlook report provides an unbiased and detailed analysis of the on-going GCC digital signage market trends, opportunities/ high growth areas, market drivers which would help the stakeholders to decide and align their market strategies according to the current and future market dynamics. Note: The report does not covers Dot LED Displays in the scope. 31.7 Samsung Gulf Electronics Co. Ltd.
Brazil Digital Signage Market (2014-2019): Market Forecast by Display Screen, Display Size, Software, Media Player, Applications and Regions.